What child names will parents choose for their baby in 2019? PregnancySymptomsTest.com predicts which baby names are cool and in the list of popular names. PregnancySymptomsTest.com has developed a unique and particularly useful tool that shows which names are going to be popular. Based on the search behaviour of (future) parents PregnancySymptomsTest.com predicts the baby names that are going to be the most popular in 2019. Handy when choosing a name for your baby! Popular Baby Names will be in 2019! 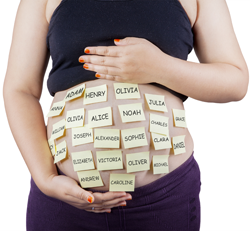 Choosing a name for your baby is part of the preparation for the birth of your child. Maybe you have had a list of favourite names for years and you and your partner can choose quickly. But what if you do not agree immediately about the name for your child or you cannot think of a suitable name that you like. If you are not having much success in agreeing then take a look at our useful name chooser tool. Choosing a name is an important task. Your child will carry this name for the rest of his/her life. In determining the first name for your child you should take several things into account: above all you should like the name and it should suit the surname; you may wish to choose several names; you may decide on a English name or one from another country: French, Dutch or a biblical name. You should think about names which are popular. What if your child is in a school class with three others of the same name? You can check on what has been the most occurring names in previous years but it is better if you already know which names are commonly occurring and which are not. Take a look at our name prediction tool above.